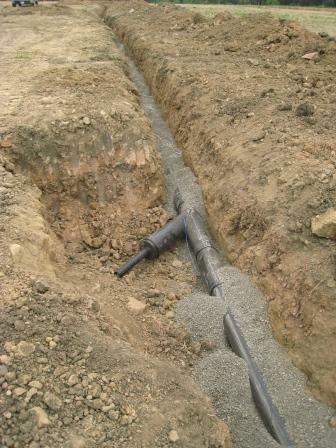 AquaBlok® products provide solve difficult geotechnical and construction problems where water or leakage is an issue. It is superior to bentonite alone due to the reliable, targeted placement and self-compacting nature of its coated aggregate core design. The product can be placed effectively in standing water and will descend through the water, hydrate, and swell, to form a flexible but cohesive seal at the target area - blocking off potential leakage pathways. We get calls from engineers almost everyday with time and cost-saving ideas over conventional practices - many of which are new but well within the geotechnical capability of the material. AquaBlok, Ltd., a manufacturer of innovative clay-based composite materials, introduces an easy to handle material that can be placed directly through standing water to address a wide range of geotechnical and construction related sealing issues. 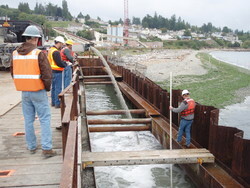 The product is part of the company's patented system for delivery of sodium bentonite and other materials in and through the water. AquaBlok® products, including HoleBlokTM and PONDSEALTM are superior to bentonite alone due to the reliable, targeted placement and self-compacting nature of its coated aggregate core design. The product can be placed effectively in standing water and will descend through the water, hydrate, and swell, to form a flexible but cohesive seal at the target area - blocking off potential leakage pathways. New geotechnical applications are being added everyday by progressive contractors and engineering firms. "What is so exciting about the use of AquaBlok in construction and geotechnical applications, is that it's uses seem to only be limited by the imagination of those applying the material," says AquaBlok General Manager, John Collins. "We get calls from engineers almost everyday with time and cost-saving ideas over conventional practices - many of which are new but well within the geotechnical capability of the material." Examples include, anti-seep collar, trench dam, overflow pipe, cut-off wall, drainage systems, swale construction, and many more. Problem Statement: Dealing with water, leaks, seals and seeps (through preferential pathways) are all common problems in many construction and geotechnical applications. 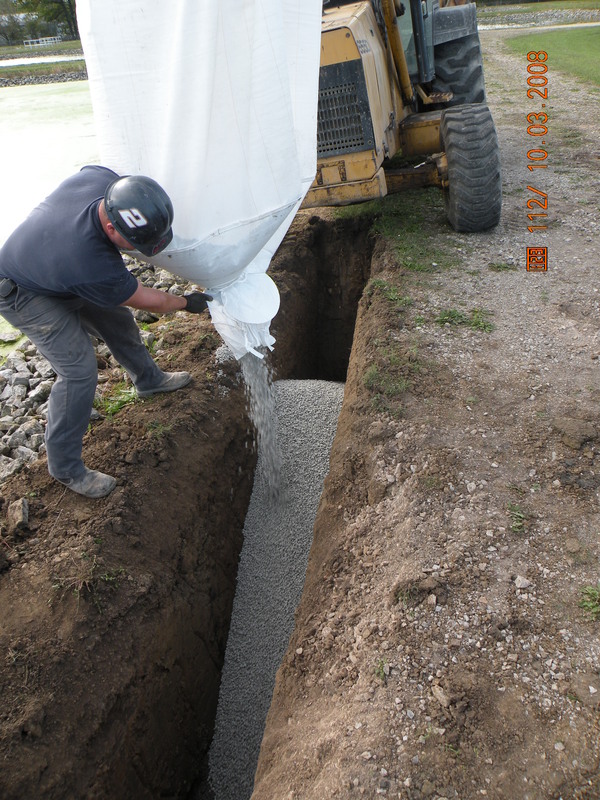 Examples include: porous or permeable soils; compromised soil liners; faulty water control structures (e.g. anti-seep collars or pipe, permeable pipe bedding materials, damaged drain systems, etc.). Often, after a leak or seep is identified, options to create an effective seal are expensive and limited. In the case of industrial holding ponds or settling basins, the only available alternatives involve draining the water from the basin before performing repairs - causing a significant potential disruption of operations. Advantages: Although pure bentonite powder and granules (or "chips") are often promoted as a remedy for many sealing applications - the aggregate core and uniform coating distribution on AquaBlok particles provides a combination of sealing capability with a higher compressive strength. This enables its use for a range of construction applications that are not possible with bentonite alone. The aggregate content also provides for improvement in shear strength of the material - compared to bentonite alone. Finally, while contractors often attempt to mix bentonite and aggregate to achieve a similar result, it is generally agreed that uniform mixing and placement (particularly in water) of materials with such large variance in bulk density is difficult and quality control, i.e. achieving a known final permeability is virtually impossible to document. The uniformly coated individual particles of AquaBlok allow for rapid bulk placement with certainty of sealant distribution and therefore greater confidence in as-placed permeability. Available Products and Pricing: AquaBlok is available in 50-lb. paper bags and in ~2,500-lb. capacity FIBC bulk bags (for large applications).